Abstract : Wrist movements are physically constrained and take place within a small range around the hand's rest position. 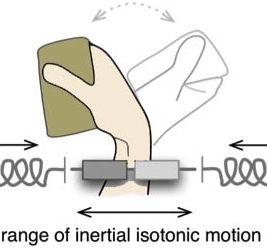 We explore pointing techniques that deal with the physical constraints of the wrist and extend the range of its input without making use of explicit mode-switching mechanisms. Taking into account elastic properties of the human joints, we investigate designs based on rate control. In addition to pure rate control, we examine a hybrid technique that combines position and rate-control and a technique that applies non-uniform position-control mappings. Our experimental results suggest that rate control is particularly effective under low-precision input and long target distances. Hybrid and non-uniform position-control mappings, on the other hand, result in higher precision and become more effective as input precision increases.